Double Down is a 2018 Lagoon 77 power catamaran that accommodates 8 guests in 4 en-suite cabins plus her crew of four. 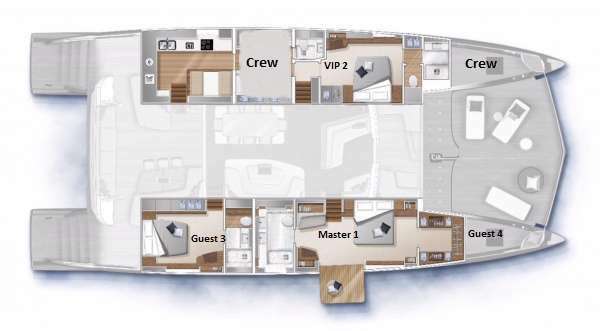 The yacht features a Master cabin, 2 Queen VIP cabins and one Twin cabin with bunk beds suitable for children. With her 36ft beam, Double Down provides charter guests the volume of a much larger yacht both in the sleeping accommodations, main salon as well as the yacht’s exterior deck spaces. Double Down has 3 dining areas. Formal dining is in the main salon, the aft deck has a nice covered settee great for enjoying breakfast or dinner outside. The third dining area is on the flybridge deck adjacent to the full-service bar. This space is great to enjoy lunch or dining under the stars where guests can enjoy a 360 degree views. The yacht’s easy walk-around decks leads you forward to the voluminous deck which has a sunken lounge area that can be accessed directly from a door leading to the interior main salon. Forward of that is an epic space one can only expect to find on yachts well over 100ft. The sundeck is covered by a hard top with retractable sunroof and has the upper helm station, full bar, exterior dining, and movable furniture. Murray was born in 1987 and is from South Africa. He has had extensive sailing experience on Oyster yachts since 2010. His yachting qualifications include: IYT Master of Yachts Limited/Unlimited, Advanced Sea Survival (OOW), AEC, STCW 95, and more. He has a passion for sailing and has sailed over 80,000 nautical miles, completed 9 Atlantic crossings, and 3 Pacific crossings. Captain Murray has an outgoing personality and always a great disposition. His interests include fishing, motocross, scuba diving, and water sports. Alize Bre was born in France in 1986. Her yachting background includes RYA Yachtmaster Offshore, international yacht training, French boating license, and PADI Open water scuba instructor. Her work experience since 2011 involves motor and sailing yachts from 62 up to 106 ft. She possesses excellent communication skills and can meet every guest’s demands. Karl’s career began in his hometown of Exeter in the south west of England where he learnt from mentors such as Michael Caines MBE. Karl went on to continue his passion for cooking in Iconic venues such as Sydney Opera House and Manchester United Football Club. He has a wealth of experience spanning 20 years and over 30 countries, Enabling him to deliver high quality and healthy cuisine to high profile clients in some of the worlds best ski chalets, villas and private households. Karl discovered his love for life on the seas 4 years ago and continues to deliver anything his guests desire from flavour packed Asian fusion cuisine to quintessentially British classics. Karl’s ethos is to use only the finest, freshest, local and seasonal produce available. He loves to deliver an incredible dining experience with a wow factor that customers simply love. Jo is from Cambridge in the UK where she spent most of her career in property and event management. After meeting Karl our chef she took the plunge and began a new life in yachting. She has never looked back and loves the opportunities to travel and meet new people from around the globe. Interests : Snowboarding, Skiing, Cooking, Theatre & Running. Contact us for rates and current availability or to book a charter aboard Double Down! Double Down sleeps 6 guests in 3 luxurious en-suite cabins including a spacious master cabin featuring private sitting area, his & hers closets, and a private balcony. The two VIP cabins both feature queen berths. All breakfasts are served with optional meat and cheese platter, smoothie of the day, fruit platter, pastries and cooked options.